When customers and clients are in need of a service provider, whether an automotive mechanic, a family doctor, or a babysitter, trust plays an essential role in setting up rapport. Just as trust is important for other service providers, it is just as important — if not even more so — when it comes to choosing a financial advisor. In fact, studies have shown that clients think of trustworthiness as one of the most important characteristics of a financial planner or advisor. The financial industry is fast-paced and ever-changing. Financial advisors are working hard to keep up with meeting new and existing clients, procedures, software and their day to day operations of their practice. As the financial industry continues to change and investment management becomes more commutated, it is more vital than ever to earn clients trust, whether they are new or existing. Trust plays an essential role in helping clients feel comfortable going to an advisor for all their financial needs. However, trustworthiness is not that financial planners and advisors can develop overnight. In order to understand how to cultivate a strong bond of trust with clients, financial advisors need to focus more on what trust is and what makes an advisor trustworthy. If you look in a dictionary, trust may be defined as — or something similar to — “reliance on the integrity, ability, strength, surety, etc., of a person or thing’. However, when it comes to the financial industry, trust is a term that is used loosely. While some financial advisors may claim they are trustworthy in order to attract more clients, how can they determine whether or not they have achieved a level of trustworthiness? To properly understand trust between client and financial advisors, one must first take a closer look at where this relationship begins. Relationship Type #1. In the early stages of this relationship, clients view advisors as someone who performs limited tasks that require specific technical skills. Most advisors who are in the beginning stages of their career will experience this type of relationship and it will likely be the easiest relationship to master during an advisors career. This type of relationship is the perfect opportunity for advisors to introduce and expand on their expertise. Relationship Type #2. In this client-advisor relationship, clients begin to realize that their advisor has capabilities that go further than technical skills related to tasks they were initially hired for. Advisors in this relationships can focus more solving general financial problems with fewer products and services. As a result, clients may begin viewing their advisor as a reliable resource for solving more in-depth financial problems. Relationship Type #3. In this relationship stage, financial advisors are looked upon in terms of their ability to put problems into context and provide a clearer perspective. As part of the organization process, advisors offer advice and identify their client’s issues. This relationship stage allows advisors to have a smoother transition to the highest level of within the client-advisor relationship — the trusted financial advisor. Relationship Type #4. When advisors achieve this level of trust with their clients, virtually all problems, whether personal, professional, emotional, or rational, are up for discussion and exploration. In this stage, clients will turn to their advisors when financial problems arise. While this type of client relationship can be time-consuming for financial advisors, it can also be the most rewarding. When clients first come to advisors, they are searching for someone who can help them navigate the financial world. Of course, they are aware of the practice’s services, but they are likely unaware of how much an advisor’s services may be able to help their situation. Because the financial markets are complex, it is essential for advisors to build trust and belief from their clients. Check out some effective ways advisors can build client trust. Clients trust advisors with their financial situations, so being responsive to clients is essential in building trust. Keeping clients updated, responding to their emails and calls, and engaging with them are all ways clients can be responsive. A responsive advisor puts their customers first, is always connected, resonates with younger and older generations, and uses modern technology to adapt. Maintaining professionalism in the financial field is very important, especially when dealing with others finances. However, if clients don’t feel like they know their financial planner, it doesn’t matter how many large financial terms advisors add to the mix. 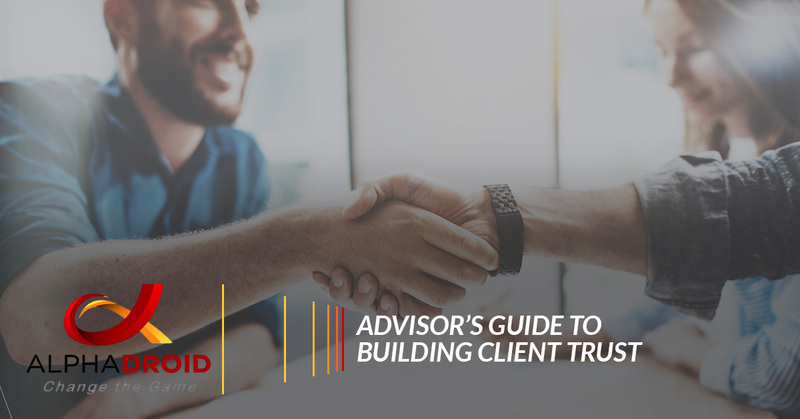 In order to build client trust, it is essential for advisors to first establish a personal connection with them. Advisors are certainly experts in their field, but their clients generally are not. It may take some time for clients to have a clear understanding of such a complex market and industry, so ensuring that clients understand what is going on is essential. By slowing down and taking the time to explain things, advisors can build upon smaller successes with the client. 4. Know and understand client needs. There are many things financial advisors can do to help ease a client’s concerns. However, one thing that can help clients feel most comfortable early on in the relationship is taking the time to understand their situation and interests. Through this process, advisors can demonstrate their expertise as they come to understand clients and how they can best help their situation. There are many ways a financial advisor can benefit from trust, like gaining new referrals, adding new clients, and retaining clients. However, when a financial advisor is trusted, they don’t need to spend time trying to sell their services and expertise. Instead, advisors can exploit their ability to listen, reason, and solve any client problems. Check out some of the benefits of being a trusted advisor. Keeping the personal connection. It is no secret that robo-advisors are a cost-effective technology solution. However, trusted advisors offer value to their clients in ways that computers and robots are unable to do. Unlike these robo-advisors, advisors are able to use experience and knowledge when it comes to risk profiling, manage their client’s emotions in rough market cycles, and provide comprehensive financial planning services. Protect senior clients. Seniors are the biggest target for financial abuse. Senior clients who are victims of financial abuse will be quick to turn to their trusted advisor. The concentration of wealth in senior clients is tremendous, and by establishing a trusting relationship sooner, financial advisors will be better positioned to handle the wealth for future generations. Establishing a niche. For financial advisors, establishing a niche is a process. However, over time some advisors may find that their reputation as a trustworthy advisor will not only assist in strengthening their credibility, but it may also help establish them as an expert in their areas of focus and specialization. Organically growing business. Building a business can mean different things, but for many advisors, it means the prospect of acquiring another practice. While this is a good mindset for advisors to have, the importance of organic growth should not be overlooked. One of the best ways financial advisors can grow organically while maintaining the health of their existing practice is to keep existing clients satisfied by being their go-to trusted financial resource. With content and engaged clients, advisors are likely to receive increased assets and additional referrals. As financial advisors grow their business and seek quality client relationships, establishing themselves as a trusted advisor is a clear path to success. However, like most paths to success, it is not always easy. Focusing primarily on relationships and trust will require time, effort, and wisdom from advisors. In the financial industry, time is something many advisors do not have a lot of. While there are plenty of time management strategies that can create more time throughout their day, AlphaDroid asset allocation software will help save advisors time to focus on important tasks, like building client trust. AlphaDroids sector momentum measurements help determine which portions of the market will likely outperform near-term. AlphaDroid uses algorithmic trading strategies to help financial advisors with analyzing, constructing, and comparing investment portfolios using Modern Portfolio Theory. 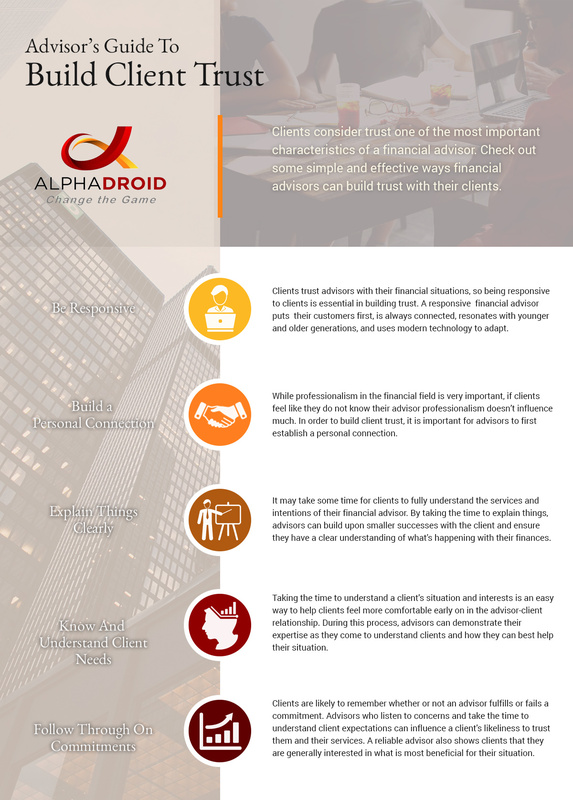 For financial advisors who want to focus more on relationships and building trust by not focusing as much on portfolio management and asset allocation, visit AlphaDroid today!